# To change fonts you have to press the menu button on your phone and select MIUI only(Arial.ttf) from within the font download portion of the app. You only have to do this once per install of app. # Devices you have to be running a custom. # ROM that supports it. # Stock rooted Samsung will not be able to change Boot Animations. 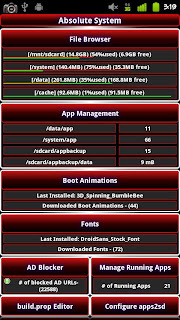 # for HTC Evo4g Users : if you've used unrevoked to root your device make sure you update to latest version of SuperUser App and su binary, as the version they install is severely crippling Absolute System Root Tools and causing great Lag on EVO4Gs. + Preview/DL Over a 200 Boot Animations. + Import Boot Animations you've placed on root of /sdcard. + Preview/DL Over 200 Fonts. + App Backup & Data to SDCard. + App Mgmt Remove System/Data apps from phone. 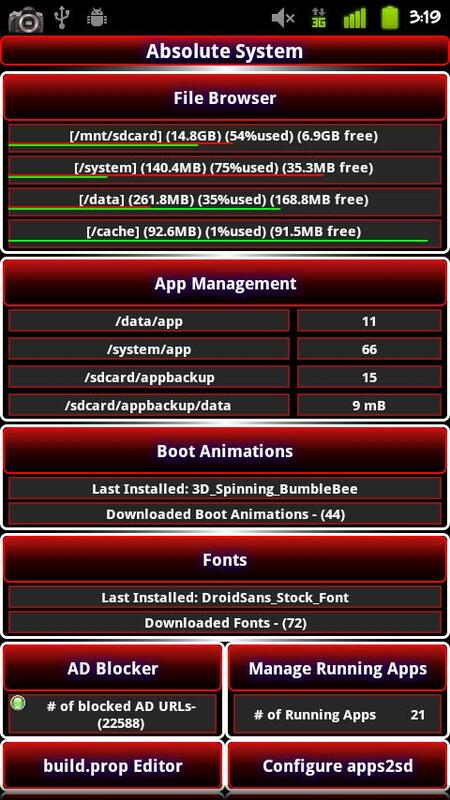 + App Mgmt Cache/Data Clear.